Let’s talk about eyelash curlers. How many of you, truthfully, have bought a cheap, spindly, flimsy pair of eyelash curlers? I see a lot of hands creeping up in the audience…nearly all of you! You, Madam – how much did you spend on your curlers? Two pounds fifty? Are you mad Madam? This is your eyes that we’re talking about – you only get one set of them! Why would you risk clamping something so flimsy and weak to the outside of your eyes? What happened when you used them, Madam? Is that why you wear an eyepatch, Madam? A totally fictional story for you there – watch the lawsuits roll in against me! Come on though – tell me you’ve not had some kind of mishap with cheap eyelash curlers? And it bloody hurts too, if you get eyelash curling wrong – when you think about it, it’s totally the wrong area of your face to be messing around with a metal contraption that looks, scarily, like a pair of surgical scissors. 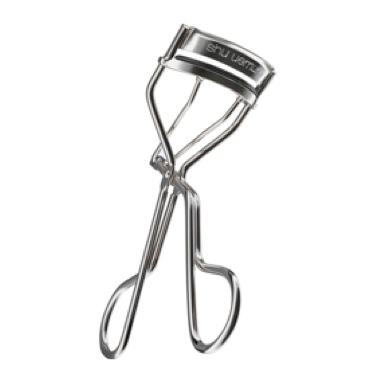 For the last (nearly) ten years, I have used Shu Uemura’s eyelash curlers, and by eyelash curlers, I mean one singular pair. Yes; my curlers have lasted that long. I have changed the rubbery bit, but only once, and I have used them about three or four times a week. That’s nearly 2000 times. How’s that for a long-lasting, hard-wearing product? I bought them in New York. I think. It’s also quite possible that I was given them, by a kind and generous makeup artist – I can’t remember for certain, all I know is that these things are the business. No other curlers that I’ve seen or tested come close, which is why pretty much every makeup artist that I’ve ever worked with (apart from a guy named Frunkel who coloured my lips in with blue eyeliner) has them in their kit. Yes, they’re £19.50, but so far mine have cost me 0.01p per use; a pair for £3.99 will probably work out at around…ooh…£3.99 per use. So. There we go. Not the most interesting of subjects, eyelash curlers, but I did give you a short extract from my new novel, ‘Misadventures with Makeup Tools – The Curse of The Moisturised Hand’, and I’ve probably stopped you from having a horrific eye-related accident. Bonus.